Somewhere under all this snow in the first picture is my little tiny flowerbed. 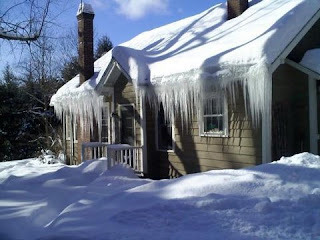 The icicles on the house took me right back to "Dr. Zhivago," where Lara and Yuri run off to the summer house, encased in ice. David Lean's version is a mite more cinematic, though. This first photo was taken by the intrepid ski tenants, who rent in the wintertime. Those icicles can't be good, right? They didn't pick up the gently used Christmas trees after the more recent snowstorm, and have not since, at least on my street. The annual chipping is rumored to have been canceled. I had to take it down; it was becoming a fire hazard. I clipped as many branches as I could use from it first. There's no place here for me to reuse the tree as a whole. (If, for example, I put food for the birds on it, it would attract rats.) So, sigh, as live in a city, I had no choice but to put it in the street. As you can see, it is waiting next to a dirty snow pile and a parked car. Where they still haven't picked it up. It is pretty easy for me to resolve to be a more diligent and skilled gardener. As I am pretty much at the rock bottom level of gardening, verging on being 'The Impostor Gardener,' this won't be difficult. I will take down my Christmas tree this weekend. I will order far fewer seed packets this year. Of course, the prices always help with this resolution! I promise to plant the seeds I order. And next fall, I promise that I will actually plant all the bulbs I order. I will keep my tools sharp and clean. Well, sharper and cleaner than they are now. I will return the plastic pots to the garden center, instead of stepping over the stacks and stacks of them. I will spread more manure around....the garden. I will spread less manure around...this blog. I will finally start researching the mixed hedgerow I've always dreamed of planting. Keep looking for more astrantias! Turn the compost more than once a season. I will never say the words "plant material." I promise not to get Lyme this year. Although, my powers over this are limited to wearing white, spraying yuck on, and being paranoid. I will weed the moss less, and try harder to envision the bigger picture when I'm out in the flowerbed. But, then my lovely moss will be weedy! Scratch that last one. Accept that I will never do that precise, proper pruning of my wisteria or roses like they say in the books, and just do the best I can. Visit Brooklyn Botanic Garden often this season to watch the changes. Seek out tree peony collection someplace nearby, and go see them when in their glory. Yum! Call the arborist about the tree limb my neighbor has been complaining about. Install a beer fridge under the pine tree?